I’m seriously enjoying two new books. That second one came out in October and I made sure my school library ordered it. You can now get it for only $1,178! I actually foresaw that and ordered early! So I checked it out from my school library! Say, the map book contains lots of really swell maps! Although the pirate’s life is not for me, it makes me want to draw maps! There is accompanying text, not just maps. Short essays. Brief cartophiliac appreciations by various folk you probably know: Philip Pullman, Lev Grossman, Cressida Cowell, others. I’m taking notes about creative priority: who builds worlds first, then finds stories to fill them? I’m very sorry you can’t get the map book anymore. Probably they will reprint it. Now I think I might be enjoying a false Watership Down map memory. I’m not sure the one in this book is the same as the one I saw as a kid. Oh well. I never understood what the difference was between “brazen strumpet” and “wanton wench”. I feel your pain, Gareth. I was of course the sort of dungeon master who read the contagious diseases table and started imagining a long-running campaign in which mysterious plagues would play an increasingly important role… The dynamics of AD&D bloat are fascinating; I always assumed it was driven by a combination of DMs with limited improvisation skills who wanted everything to be set out for them just in case, players who didn’t trust the DM so wanted an ‘objective’ probability for everything, and the designers’ anticipation both of these problems and of the lucrative possibilities of never-ending supplements. Peter T lies. The original (pre-AD&D) games were actually hideously overbuilt, but we were all children at the time and ignored most of the rules. I tried redoing the game following the rules as written and it is absolutely awful. Keeping track of oil, counting copper pieces – it’s hideous. Also the introductory adventure is ridiculously badly designed. The reason D&D was successful is that role-playing games are an awesome idea, not that Gary Gygax designed a good game. Awesome, that is a much better deal, D Franklin. I will direct readers that way. It’s been interesting watching my son discover the old books and now spend his pocket money on the current version – which is still extraordinarily complex in theory (tables of ‘foibles’, quirks, and back-stories etc for generating characters). He pores over them, as I did mine, and then just goes ahead and plays fast, loose and very freestyle with his friends. There’s some words in the Dungeon Master’s Guide to the effect that the DM can modify or ignore any rule they don’t like. So it’s kind of official that D&D groups are going to ignore anytable they think is stupid. I regard it as more like a kit of parts for building your own world, rather thana finished exercize in world-building. (With some parts that most people don’t use). On the art: that was never D&D’s strong point. (The infamous chainmail bikini deserves a mention at this point). Dave Trampier came to a strange end. I loved his stuff. It’s pretty difficult to figure out what M. John Harrison is actually talking about, but Le Guin seems to be a counterexample to whatever point he’s trying to make. I never thought the original D&D became playable until Greyhawk came out. I’m taking notes about creative priority: who builds worlds first, then finds stories to fill them? I am immediately remind of the long-running development cycle of perpetually-in-development roguelike Dwarf Fortress, which has devoted as much time and energy to creating systems to procedurally generate ever more complex fictional geographies, cultures, legends, and histories to act as a backdrop for the game as has been devoted to the game itself. SusanC, I think you’re making my point there – D&D was only ever good if you ignored most of the rules. But the rules were there for a reason – because GG was a weirdo who liked to keep track of oil. In fact, the “implausible” thing you’re doing as a player is walking in and out of the dungeon: you move 120′ per turn, and an oil flask lasts 6 turns. Exploring a 10’x10′ section of dungeon takes a turn. You need to carry more oil than you can bear just to get to the first room! And if you think that the early rules were smooth and easy, check out this dragonfoot forum on burning oil. Should the flask make a second saving throw if it bounces off the monster unbroken and hits the floor? For a while a few years back there was a weird movement that was retconning the history of D&D to make it seem like the early rules were great and the game had certain traits like a) no overly complex rules b) extreme lethality and c) well-designed modules but in my experience of trying to play it by the rules as they were designed it has a lot of stupidly punitive rules, it isn’t very dangerous (though it’s occasionally randomly bad) and the modules are awful. Another part of this old school renaissance is the idea that objectively awful artists like Trampier were good – but in reality the art of the early editions was terrible. And compared to what companies like Fria Ligan or SixMoreVodka produce for their games now, laughable. I think this must mean that somewhere along the way the tools of art became much more accessible and widely available, and I would love to find out what happened to democratize the art of small companies (this applies to board games and illustrators too I think). To bring the themes of the 2 books together, one of the D&D products I think I most enjoyed as a kid was the full color poster map of the World of Greyhawk, conventionally known now as the “Darlene map” for Darlene Jean Pekul who produced it. She was also involved in early D&D visual design in general. 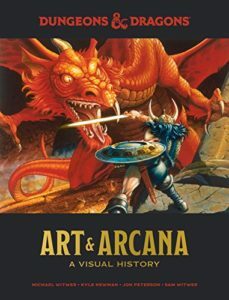 In an interview that I can’t find any more, she noted that there was already an established style for fantasy art (think Boris Vallejo and Frank Frazetta), but that D&D deliberately went in a different direction. Note that there are not many shirtless hypertrophied muscle men in the early D&D books. As far as ignoring rules goes, yes, every group ended up playing its own stripped down version of the game. It’s funny though how big a difference some of those often ignored rules make. Playing using the full morale rules (rarely used in my experience) really changes the game. 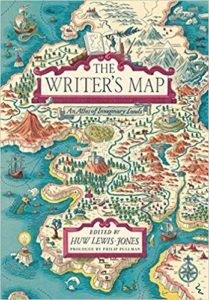 Funny; I ordered The Writer’s Map from Amazon in December and got it with no trouble. I enjoyed it enough that I bought The Selected Works of T. S. Spivet, one of the works discussed. A possible defense of having an excessive number of random encounter tables: they are there to act as prompts for when the GM is temporarily stuck for ideas for a side quest, and it helps to have a diversity of material in the tables so the GM can find something suitable. When players get stuck, they can resort to searching for secret doors (AD&D) or library use (Call of Cthulhu). This can function as a subtle plea to the GM “We’re stuck here, can you give us a hint”. Which the GM then does by telling you what your charcaters found after conducting a thorough search of the room, or after spending a day reading the Necronomicon. The tables need to be sufficiently large that the players don’t get a sense of “hey, we met a NPC just like that in the previous village”. I’m not old enough to have started before 2nd edition AD&D, and we certainly ignored half the rules. From what I can tell from later accounts about how Gygax and his crews rolled, the games started as essentially strategic puzzles–how do you extract as much treasure as possible from a dungeon without depleting your resources of food, water, rope, 10-foot poles, and hireling spear-carriers and torch-bearers? So keeping track of exactly how much rope or oil you had was vitally important. I never knew any of this as a kid; part of the appeal of AD&D was how opaque and mysterious the rules are. No one ever really laid out in the rulebooks what any of this looked like in practice. You just sort of had to piece it together, and skip over the stuff that was too complicated. In North America, the book is available direct from the American publisher for $45. To me, Gygax’s AD&D sems to have less world building than later role playing games. Call of Cthulhu explicitly imports all of H.P. lovecraft’s world building. Paranoia is fairly specific about the kind of post apocalyptic SF dystopia it it is set in. But AD&D – the rule books are a very heterogenous collection of stuff from many sources. Those creatures in the Monster Manual probably don’t all exist in the same fictional universe – its up to the GM to exercize some kind of selection on it. (I would make a distiction between the adventure modules and the core rule books). World-building is the supply to the completist’s demands. Myself and my best friend played D&D as relatively minor participants among a particular group of people who, so we thought, “made up the rules as they went along” – this was before the DMG, the PH and all the rest – just using the old softback rule books which we all had and all thoroughly marked up with interpretations as we went along. Not realizing that making up the rules was part of the intrinsic joy of the game we broke away to form a new clique of purists that were going to play by the rules as written – or so we thought. At the first session, I think there were 6 in the party and my friend was the DM. After creating a fresh set of brand new characters, before he let us set out we had to equip our party for a planned 20 day quest to explore caves for Orc gold. As alluded to above we stopped in at Ye Olde General store and we started buying oil, rations and other basic provisions which of course necessitated horses which of course then meant we needed hay so then we needed carts etc. ….by the time we tallied it up it came to some crazy figure like 1000 gold pieces (or something I don’t honestly remember) – which of course was more gold than the newly formed party had (clearly provisioning only works for those who have already successfully plundered orc gold). It was at that moment that we realized playing by the rules required some interpretation.